New York: Riverhead Books, 1999. Croatian translation Iznuđivanje published in 2002. Strongly recommended! 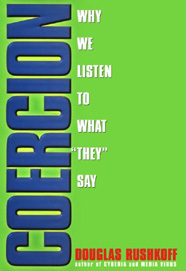 The book is a brilliant and eye-opening study of coercive and manipulative techniques used in marketing, media and elsewhere. Rushkoff is speaking from the inside - for years he worked as a business consultant for many institutions and companies, including some from Fortune 500 list. The book won the Marshal McLuhan Award for Best Media Book. To find out more about the author Douglas Rushkoff, and this and other of his books, and to see excellent documentaries he made for PBS, visit his web pages on www.rushkoff.com. The pages also include his blog. Penguin Putnam, New York, 2001. Croatian translation Doba pristupa published in 2005. 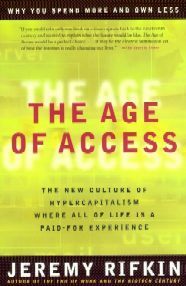 The Age of Access by Jeremy Rifkin analyses and predicts the dramatic changes that happen in capitalist system for the reason of shift from geographically determined markets to network economy and e-commerce, and from industrial to cultural production. Property and normal public life are being replaced by the right of access, where concepts, ideas and imagination, not physical objects, become the real value, and where almost all of the everyday experience and every aspect of human life become a paid-for commodity. Rifkin analyzes the phenomena from the economy and politics, such as selling of services and experiences (not things any more), co-sourcing and outsourcing, leasing relationships that replace traditional trade and property, importance of intangible, non-physical "property" in the modern economy, and from culture, entertainment and every-day life, such as Hollywood networking model, commercialization and commodification of culture and human relations, selling of "experiences" in today's mass tourism etc. All those things happen in the world where more than 50% of the population never made a phone call, and only a privileged minority of rich has the access to new information and communication technologies. Jeremy Rifkin is the author of about 20 books about the impact of the scientific and technological revolution on the economy, society, culture and environment. His books were translated to more than 20 languages. Rifkin is a founder and president of the Foundation on Economic Trends (FOET). Rifkin's biography is available here.